Edit: I received quite a few more holiday greeting submissions, including several beautiful examples in the comment section. Thanks, everyone! Each year, institutions find creative ways to show they appreciate their community during the holiday season, and 2013 is no different. I’ve collected a few excellent institutional examples (and would love to see more) of how you’re all spreading the joy this year. A few years back I compiled holiday outreach examples from institutions, and last year the Chronicle of Higher Education featured holiday video cards from colleges. This year, you can also check out Karine Joly’s collection as well as Educational Marketing Group’s #EDUholidays. 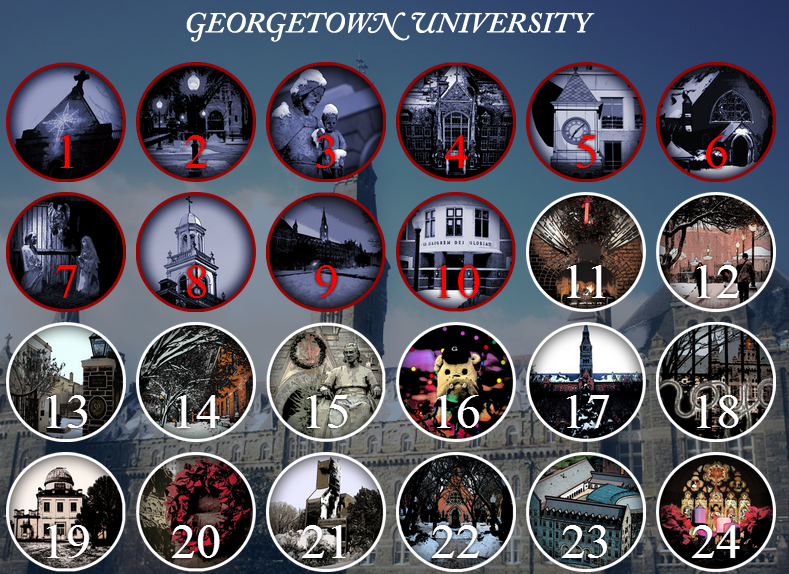 Georgetown University has a really cool interactive Advent calendar. For those of you not familiar with Advent calendars, they’re three-dimensional cards with doors for each day of December leading up to the 25th. Behind each door is a small treat, like chocolate or a figurine. Georgetown’s online calendar features screensavers, a cappella videos, fun facts and more. I’m looking forward to seeing what each day brings! Some institutions incorporate year-round features into their holiday greetings: Webster University‘s Global Snowglobe is a mobile-friendly site that shows each Webster campus around the world when you “shake” the snowglobe. Oakland University cleverly tied in annual report themes in its “Year in Review” holiday video, and the University of Missouri College of Education invokes a strong sense of nostalgia with a video featuring historical photos. I’m also seeing quite a few examples of ways in which institutions are emphasizing community service. The University of Cincinnati is waiving parking fines in exchange for a holiday toy donation, and the University of Arkansas has a “You of A” holiday tree, decorated with ornaments representing staff, faculty, students, departments and campus organizations. Elon University sent out its Flickr album of gorgeous 2013 Festival of Lights photos. High Point University‘s 2013 video showcases its holiday traditions: students volunteering, its Hanukah Dinner, and other ways it reaches out to the broader community. Don’t have a whole lot of resources—or perhaps you’re at an independent school and would like to feature some student-generated content? Check out Khan Academy’s Hour of Code tutorial, which will show you how to code an e-greeting card. What are you doing for the holidays? I’d especially love to see examples from independent and international schools as well as community colleges. Here is our UC Berkeley Holiday Card for 2013. Oh wow, I LOVE the Soundcloud shareable playlist idea! Very smart. Here is ours from The University of Findlay. Mascots + holidays + narrative tension = a clear winner! Obie babies! (B’Obies?) Wicked cute and clever, too. Here is the link to Indiana Wesleyan University’s Christmas e-card. Happy Holidays to all! Thanks, Ken! This is really, really well done. Courtney & Sarah: Thanks for sending along—these are awesome! The figurine/paper cutout video is adorable, and I’d love one of those giant marshmallow-filled hot chocolates Morgan CC’s president has.